John started playing chess at age 6 and competing in tournaments at age 8. In 2015, at 14-years-old, John broke an impressive record: youngest ever to reach a 2600 rating. 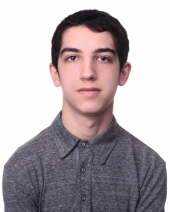 He is currently the #3 rated chess player under the age of 16 in the United States. He recently competed in St. Louis at the 2017 Saint Louis Winter Invitational. This will be his first appearance at the U.S. Junior Championship tournament.